Samsung Electronics came up with a blueprint of Universal Flash Storage (UFS), a next-generation memory for mobile gadgets. The semiconductor giant is planning to take the lead in the future mobile device market by securing competitiveness in the UFS sector. Samsung Electronics sketched out its future strategy on UFS in the Mobile & IoT 2016 Forum held in L Tower in Yangjae-dong of Seoul on August 17. “As King Arthur subjugated the whole nation with the magical sword Excalibur, the Excalibur of a future mobile world will be none other than UFS.” said Cho Hee-chang, a senior research fellow at the Memory Business Division at Samsung Electronics who made a presentation under the theme of next-generation mobile storages. According to Cho, it is expected that all connected devices in the world will total 50 billion in 2020. 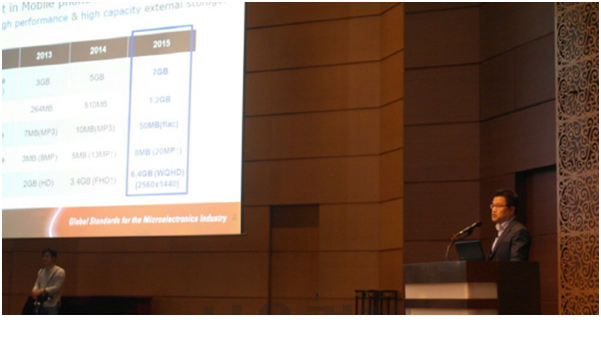 In particular, Cho projected that the use of high-capacity and low-power consumption UFS will expand. The performances of Samsung Electronics’ UFS are expected to improve a great deal. Kim Do-kyun, a senior research fellow at the Memory Business Division at Samsung Electronics forecast that the external UFS card V1.0 which transfers 600MB per second will upgrade to the external UFS card V2.0 which transfers 1.2GB per second by the end of the first half of 2018. In addition, the internal UFS 2.0 and 2.1 which transfer 1.2GB per second are expected to jump to the 3.0 version which transfers 2.4 GB per second in the first half of 2018. Internal UFS devices are expected to become able to realize a transfer speed of 2.4GB per second that is more than two times faster than current products in the first half of 2018. 256 GB UFS which Samsung Electronics began to roll out in February has a reading speed of 850MB per second. Both presenters said that Samsung Electronics will steadily lead the UFS market with its cutting-edge 3D NAND flash memories and high-performance controllers.